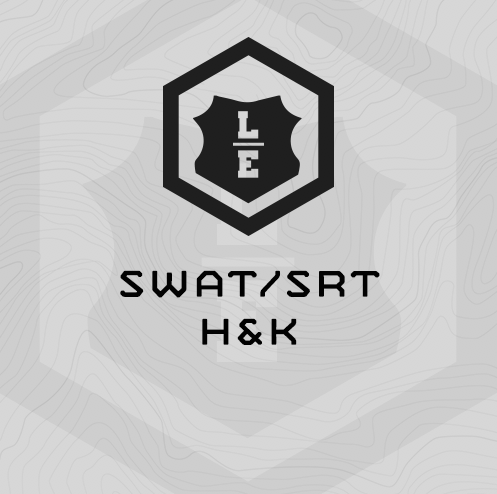 “H&K” is the fourth in our 4-plan “gun maker” series of training plans for full time Law Enforcement SWAT and SRT team members. This is a 6 week, 5 day/week training cycle for a total of 30x training sessions. H&K is a “balanced cycle” and trains these 5 fitness attributes in generally equal proportions. Strength – H&K steps away from heavy strength work to focus to train bodyweight strength. Monday’s bodyweight work deploys assessments in weeks 1 and 4, on body armor dips (men)/hand release push ups (women) and body armor pull ups (men)/chin ups (women). Monday’s lower body work deploys unloaded full and mini leg blasters. Wednesday’s bodyweight strength work deploys our “bodyweight” complex methodology where we group three bodyweight exercises in the same circuit. Often two or more of the exercises have an explosive component and we want athletes to move immediately from exercise to exercise. Work Capacity – You’ll train work capacity two times per week during H&K, – back to back on Wednesdays and Thursdays. Wednesday’s efforts will be 20 minutes loaded, “strength cardio” interval work including 20 rounds of 30 second 1-arm dumbbell/kettlebell clean and press, and 30 seconds rest. Wednesday’s you’ll complete the same AMRAP circuit each week …. sandbag getups + a 50m shuttle with the sandbag … but each week’s effort will increase in duration. You’ll begin at 10 minutes, and finish at 15 minutes. Endurance – H&K’s endurance work is focused on improving your aerobic base. We use unloaded runs, unloaded step ups and a combo of runs and step ups, at an easy pace, to train endurance. TAC SEPA – Split between two types of events – multi-level agility and sprints/shuttles. You’ll complete drills unloaded first, and then loaded in your IBA or 25# weight vest. Chassis Integrity – Both Wednesdays’ and Friday’s you’ll complete long grinds of a total body, rotation, anti rotation and extension (low back) midsection exercise. Fully-equipped functional fitness gym including racks, barbells, bumper plates, plyo boxes, dumbbells or kettlebells, sandbags (40/60#). Sprinting area for shuttles – 25m. These can be outside. What if I miss a training session or have to skip a day? Regardless of your training schedule, don’t skip ahead in the training plan. These sessions build upon one another, and need to be completed in order. Start again where you left off. All unfamiliar exercises can be found at our Exercise Page. What if I can’t complete the work capacity efforts at the prescribed loading? Drop load as needed to make the prescribed reps in the prescribed time intervals. Be smart. What if I don’t have a piece of equipment or fully equipped gym? Be resourceful. Many of the prescribed barbell exercises can also be completed with their dumbbell/kettlebell versions. If you can’t create a good exercise substitution, you can always email rob@mtntactical.com for help. Sprinting area for shuttles - 25m. These can be outside. (3) Max Dips (men), wearing IBA or 25# Weight Vest in 60 sec. Max Hand Release Push Ups (women) wearing vest/IBA in 60 Sec. Pull Ups (men) or Chin Ups (women) in 90 sec. You can stop and rest during the timed events. Just keep working the entire time and get as many reps as possible. Rest as needed between events, but no longer than 3 minutes. Dips - pause at the top and bottom of every rep.
Loading: Men use a 45# dumbbell or 20kg Kettlebell. Women use a 25# Dumbbell or a 12kg Kettlebell. Use SESSION 1 Max Rep Pull Ups/Chin Ups for Part (4) percentage. Parts (1)-(3): Work rapidly from exercise to exercise - no break. The stretch in each circuit is your “working rest” between rounds. (2) 750x Step Ups, Easy pace.